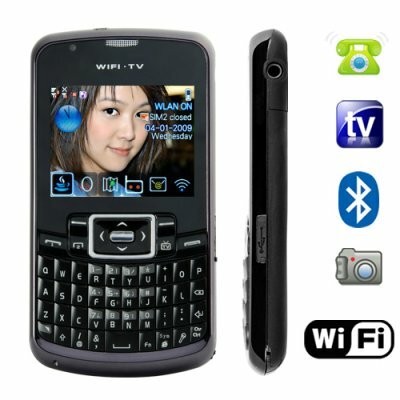 Successfully Added Amigo - WiFi Quad Band Dual-SIM Cellphone with QWERTY Keyboard to your Shopping Cart. Say hello to your new best friend - The Amigo WIFI GSM mobile phone with QWERTY keyboard that comes with a free 2 GB TF / MicroSD card! Just when you thought things couldn't get any better than work and play with our Voyager, Odyssey, and Thunder smartphones, we're excited to unveil the CVEM-M79 web ready cell phone with keyboard. Welcome to the next stage in mobile phone dominance! If you could only choose one phone to take with you on your way to the top, we suggest The Amigo. It's got brains, brawn, and beauty all in one! Brains: The Amigo is a first class quad-band mobile phone that operates seamlessly on the four standard global GSM frequencies (850MHz, 900MHz, 1800MHz, 1900MHz) so you can trust it to work anywhere in the world. It has two SIM card slots which is perfect for people who want to keep two active phone numbers inside one great phone! More importantly, the CVEM-M79 was never locked so you can use it with any cell carrier or network you want. Brawn: In terms of communications, what's more powerful than web access side by side with cellular networks? And with the CVEM-M79 getting on the internet has never been easier. Simply scan for available wireless connections. Choose your connection and click "Connect". Seconds later, you're checking email and surfing the Internet. Add to that, versatile media functionality to play all your favorite audio and video formats, a still and video camcorder, radio and TV and you can even install java apps...how that's for power? Beauty: If you've used other Chinese cellphones in the past then you'll definitely notice an improvement with this world phone. As a result of firmware improvements, the user interface is much more responsive. Menus are more intuitive. Actions happen quicker. What's more, The Amigo is designed with elegance and endurance in mind with its solid candy bar form which is only 10 mm thick and piano black exterior constructed from rugged low tensile polymer. It has a generously sized QWERTY keyboard which makes it ideal for texting like those found on the Nokia E63 and E71 as well as Blackberry and Blueberry phones. Last but not least, it features 7 action buttons with 4 directional keys for extra input precision. The Amigo is a powerful interactive intelligent cellphone perfect for today's business man or woman. Don't delay, click "Add to Cart" right away and in a few days you could be the proud owner of this state of the art WiFi ready dual SIM quad band QWERTY keyboard mobile wonder! Brought to you by the leader in factory direct China electronics - Chinavasion. on 2010-06-25 10:02:05 is o.k. FUNCIONA DE MARABILLA LA CAMARA NO ES MUY POTENTE PERO LA SEÑAL DE TV LA AGARRA MUY BIEN ESTOY COMPLETAMENTE SATISFECHO CON ESTE PRODUCTO MUY BUENO LO RECOMIENDO. Great phone, got it in 5 days after purchase.